With the big game over and done with, it’s time to wrap up the leftover party subs, put your game-day jerseys back on the hanger, and accept the inevitable…football is over. But don’t despair! With your Sundays free again, now is the perfect time to take aim at those home improvement projects you’ve been putting off during the season. To help get you tinkering, we explore some great and simple DIY projects to help fill the void until you can get you football fix next fall. If your shower head is dishing out low water pressure, it might be blocked up by hard water deposits and need to be replaced. To install a new shower head, first, make sure that the water is turned off. An adjustable wrench can help loosen and unscrew the old showerhead, then use a knife to remove plumber’s tape around the shower arm and scrub the threads with a toothbrush dipped in vinegar to wash off any mineral deposits. After wrapping new plumber’s tape around the clean threads (clockwise), place the new shower head onto the shower arm and twist clockwise. Give it a test run by turning on the water, and if leaks occur, gently tighten with an adjustable wrench one-quarter turn at a time. Your car’s interior takes a beating throughout the year, but especially during the colder months as it accommodates snowy passengers and their wet, salt-caked boots. Give your mobile home a mid-winter refresh by removing everything from the center console and seat pockets and giving it a deep clean with warm water and gentle cleaning products. Vacuum the floors and seats, and spend some time perusing the trunk to see if you’re carrying around unused items (golf clubs?) that you won’t be using for a while. And make sure to wipe down your steering wheel, center console and interior door handles with cleaning products, as these areas can collect germs and the cold virus. 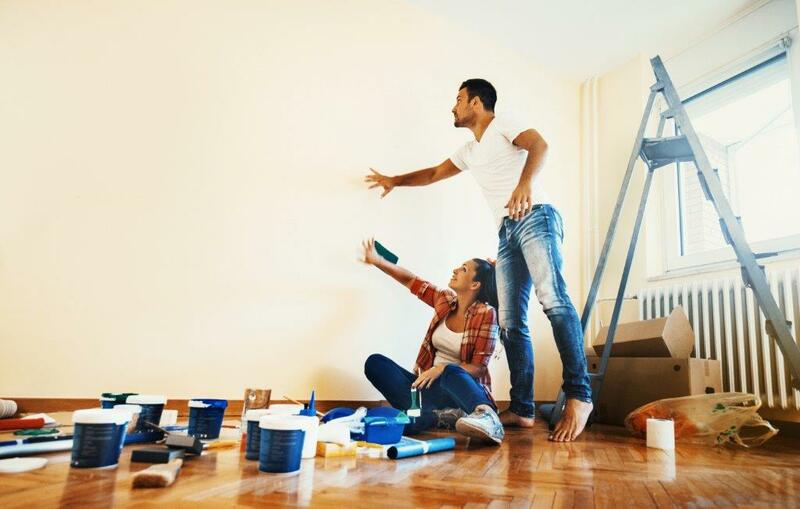 If you find yourself growing tired of staring at that same beige or egg-shell-colored wall, winter is a great time to take aim and do some repainting. Re-imagining a room in a new, brighter color can help lift your mood and shake up the energy of the space. Start out by gathering some color swatches from a paint store and leave them up on the wall for a few days to see which looks best. Before starting, make sure to open your windows to let in some fresh air while you paint, and opt for eco-friendly, low-VOC paint if you can. Ideal for spring time, this project helps give your garden a more intentioned and curated look by forming borders to separate your lawn from other elements of the garden. After marking the boundaries of the bed with string, you can use a flat-edged shovel to very gently slice into the turf, using your string as your guide. Once you’ve removed the loosened dirt, lay down 2-3 inches of mulch along the boundaries of the string for a professional, crisp-looking garden. And in subsequent months, you can re-visit your handiwork with some edging shears to help maintain the clean borders in place.